DESCRIPTION: Brightholme is the perfect place to enjoy all that Mt. Desert Island has to offer as well as a place to relax after a busy day of sightseeing throughout Acadia National Park. 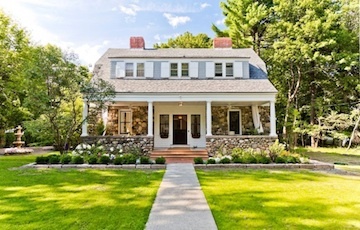 Once part of the Kenarden estate built by J. S. Kennedy in the late 1800s this beautifully renovated property was to be the first-ever designer show house for Maine Home and Design in 2014. With it's classic white picket fence and front covered porch with brick paver's at the street and entryway, you'll feel the welcoming effects of this lovely home. 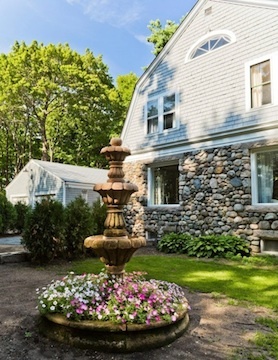 This property offers lots of room and amenities to help you enjoy your vacation on MDI. Located within walking distance to all that Bar Harbor has to offer including the infamous Shore Path as well Acadia National Park entrances which are just minutes away by car. Enjoy your mornings and evenings relaxing on the beautiful front covered porch. LAYOUT: FIRST LEVEL: Spacious living room with hardwood floors, comfy furnishings and a lovely staircase leads to the second floor. Light filled dining room with hardwood floors and seating for up to ten. Update kitchen with upgraded appliances, gas stove, dishwasher and Island with stools. Off the kitchen is a bedroom with queen size bed and lovely bay window. From the kitchen leading towards the back is a 1/2 bath, another stairway to the second floor, and a spacious family room with a kitchenette/bar area and seating, large TV and 2 comfy sofa beds (both queen size) perfect for extra guests. Also find a second entryway from the side leading to the Family Room. SECOND LEVEL: Master bedroom with king bed, private full bath with large glassed-in shower and dressing room. 3 additional bedrooms all fitted with a queen bed and share a 3/4 (no tub) bath with large glassed-in shower. On the back side of this home you'll find two additional smaller bedrooms each with a double bed and a shared full bath with tub/shower combination. SPECIAL CONDITIONS: $150 per person, per week fee for additional guest over posted allowance in rates.